There’s a general belief in firms that one must move up to progress. But in an SME, that’s rarely possible. Modern SMEs have flat structures and opportunities to move ‘up’ are few. So it’s often assumed that ambitious staff in SMEs have to leave to advance. The problem is in the definition of ‘progress’. The Collins English Dictionary states that progress is ‘movement forwards’ and ‘an advance’. And staff generally accept this definition when considering their career. The implication is that progress must always be linear – and upwards in the organisation structure. Let’s take a look at one concept to break this mould to allow staff to enjoy a career and long tenure with one firm. The solution involves staff moving laterally – sideways. But first, there are some mind-sets to be changed. The problem’s compounded by a general reluctance by those early in their career to move anywhere but upwards - ‘sideways’ is not an option. The attitude is exemplified by the software developer who wants to stay close to code. He can’t accept that a move into test or product management would be en route to something bigger. This problem perhaps stems from disinclination to take risks or a lack of understanding that moving sideways is also progress. Often senior managers don’t accept that folk have transferrable skills – and that people can develop to take on new roles. There’s the assumption, for example, that if the business needs a salesperson, an engineer could never do that successfully. Or there’s the assumption that someone from the shop floor just hasn’t got what it takes in finance. These assumptions are flawed. Skills are transferrable and staff can be developed. Progress must also be re-defined on a personal level. It’s the taking on of greater responsibility, making greater contribution to the business and gaining greater personal achievement. 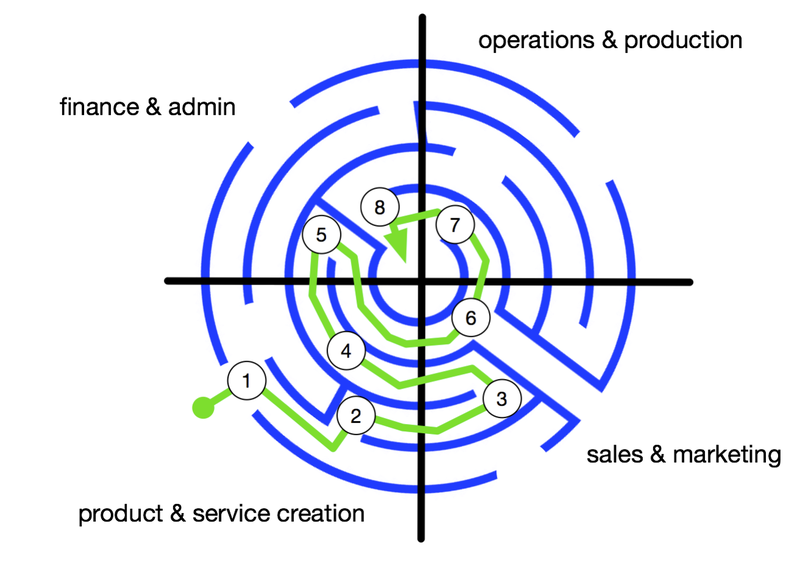 Some commentators also say that it’s generally ‘moving closer to the business’, signified by inward movement on the circular model in the diagram above. Key staff on which the business depends are conceptually at the centre of the maze. With that re-definition, lateral movement, moving ever closer to the firm, makes sense to all. So let’s plot an example career using the model above. Take a software developer. He or she joins the firm and enters the career maze bottom left in the ‘product and service creation’ quadrant of the model at point 1. There is opportunity for movement in this quadrant, perhaps from software engineer to product release lead at point 2. One obvious growth to acquire new skills would be a move across to be more customer facing – in roles such as product management or technical sales. This is shown as a move to point 3. This move would give hugely desirable commercial experience – a must-have for all key staff. This might then be rewarded with lateral movement back into R&D as a leader at point 4. The jobholder would bring with them deep understanding of customers and their needs. Now, any leader in R&D headed for greater things will need to have good command of finances and of strategy. Whilst it might be slightly unusual, this can be acquired by a move to take responsibility for admin and the whole finance and contracts side of the business to point 5. Understanding of both products and customers would be invaluable here. By now, you get the idea. The person has gained a huge experience and deeper understanding. They’ve done maybe twenty discrete roles and eight discrete jobs over a period of maybe ten years. They could happily stop at any point and continue to achieve in that job and its roles. Or they could plan and train for the lateral moves to come. The important point is that with each move comes a deepening personal meaningfulness, responsibility and contribution to results. For an employee, those are hugely beneficial. Those mental states are indeed why folk come to work! And for the firm, it has kept the employee engaged whilst acquiring valuable and exploitable skills and knowledge. So how can this be made to happen? There are three issues – availability (of such lateral moves), their attractiveness and the precedent and visible accompanying benefits for those who’ve gone before. On availability, management must create the concept of such moves. Instead of hiring a new salesperson, management should consider re-training someone from operations or product development to take the role. Of course, just because the job is available does not mean that anyone will apply. Management must extol the benefits of lateral moves and dispel myths that such moves wreck careers. The move might be accompanied with increased training whilst highlighting a few other sweeteners such as travel and the ability to build relationships with clients and suppliers. All of this is only possible if lateral career development is discussed and accepted in the company. Those who trail blaze must be seen to grow their social and intellectual capital and their general experience as a result. Fundamentally folk must see that there’s benefit in breaking the progress-is-upward mould. Of course there’s a condition on all of this. It’s that management must encourage and secure a risk-taking culture among staff with an associated low risk of failure. If the development engineer fears that he or she will not be supported in making their move to marketing, they’ll be disinclined to take the risk. If it doesn’t work out, management must own the ensuing problem and recover the mover’s status and standing in the company. If risk taking is not encouraged, or is rewarded with penalties, lateral movement will simply magnify existing problems and probably increase staff turnover.